Over the years, there has been great debate about what brand has the best hockey skates. The answer is simple, the brand that fits the skaters foot the best. Too often, amateur players want to emulate the professionals and wear the same equipment they do. Professional players help the different companies by marketing their products. In some of these instances, the players are compensated monetarily. Unfortunately, for the amateur player they are not being paid to wear the equipment. So their focus when purchasing skates should not be on what company promotes their hockey skates the most or aesthetically looks the best. Instead, their focus should be on what each company's family line fits the players foot. The best hockey skates are ones that identify the correct foot type, heel lock, and proper stiffness. In determining what the best hockey skates are the first thing the player should be aware of is their foot type. Each player has a specific foot type that fits a certain hockey skate. The player should know his size, width and arch type. If the player is unsure of the foot type, an experienced hockey shop professional would be able to determine what the foot type is. Once the player's foot type is determined then the best hockey skates will be chosen from a companies family line. For example, the two leading skate manufacturers have three fit families designed for different foot types. 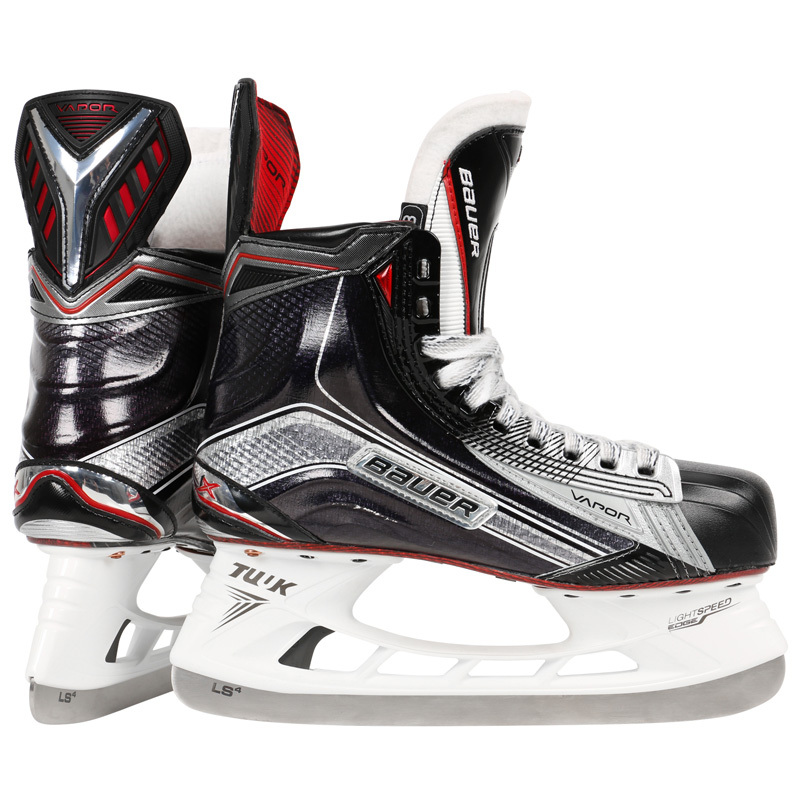 Bauer's three boot styles consist of the Vapor, Supreme, and Nexus line. The Vapor line fits a more tapered forefoot, medium to low volume, and a standard "v" heel pocket. The Supreme line fits a more contoured forefoot, medium to high volume, and a more standard heel pocket. And the Nexus line fit is going to have a wide forefoot, high volume, a deeper "v" heel pocket, and a high in-step. 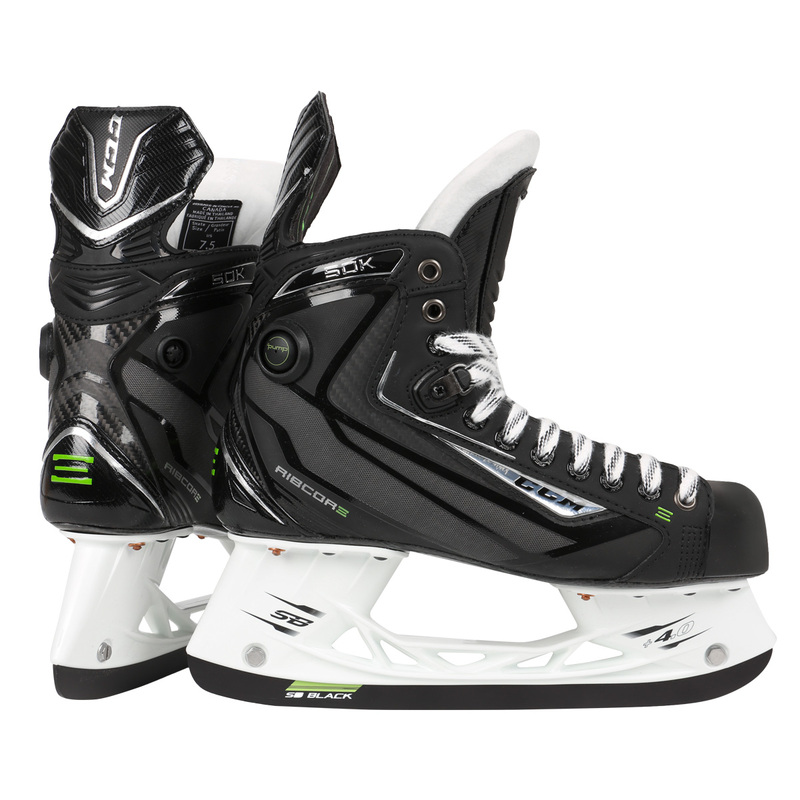 CCM's three boot styles consist of the Tacks, Ribcore, and Jetspeed line. The Tacks line fits a wide forefoot, high volume, and deep heel pocket. The Ribcore line fits a slightly narrow forefoot, low volume, and narrow heel pocket. The Jetspeed line fits a standard forefoot, medium volume, and standard heel pocket. The best hockey skates also have the proper heel lock for the individual player. Heel lock is defined as the foot being flat on the outsole, having zero to minimal movement, and proper warp for the heel in the pocket of the skate. If the heel has movement then the skater's stride can be affected, the heel can develop blisters, and the rubbing can cause discomfort and affect the players skating ability. Finally, best hockey skates are also the ones with the proper stiffness and factor in the individuals amount of ice time per week. Stiffness of a skate is defined as the level of flex a player can get in a particular skate model for their skill level. Depending on what level your are and what you weigh will determine which stiffness and model skate you should be in. For example, the best hockey skates for a player that is on the ice five times a week such as a elite player that has above average to good leg strength and weighs more, should be in a stiffer skate. The stiffer skate will give them better ankle support, durability, and better protection. The best hockey skates for an intermediate club player that is on the ice three to four time per week should be in the mid range price point. The skate still offers good protection and proper stiffness but also does not affect the players skating style. The best hockey skates for a recreational to beginner skater who is on the ice one to two times a week would be in a lower end skate that has adequate ankle support comfort and less of a break in process. In conclusion, the best hockey skates will be the brand and model that fits the foot. After outlining these three factors and what to look for consumers will have the knowledge going forward to consistently purchase the best hockey skates for their foot. Over the past ten to fifteen years, the price of hockey equipment has increased in all categories. For example, top of the line skates have seen their retail price double in that time period. Composite one-piece sticks have been no different. Because of this consumers have started to bargain shop and they have seen some benefits in purchasing clearance hockey sticks. The first benefit a consumer sees with clearance hockey sticks is cost. Companies have different lines for each piece of equipment, sticks included. In that line there are a few models, each in a specific price point. For a new or current stick the price ranges from fifty to two hundred and seventy dollars. There is usually a two year life cycle for each before the company changes them but in recent years some products have only had a one year cycle. If a retailer does not sell through all of its sticks then they become discounted. Each retailer uses their own formula to generate its sale price for clearance hockey sticks. With a top of the line stick a consumer may save up to a hundred dollars on a stick which for the consumer can go a long way. The second benefit a consumer sees with clearance hockey sticks is experimenting with different patterns and flexes at a reduced cost. Most companies have between three to five patterns and five to eight flexes. A pattern is the curve and lie of the blade of a stick. The flex is the bend in a stick as a person leans into their shot. The higher number of flex the stiffer the stick is. The lower the number of flex the whipper the stick is. Since clearance hockey sticks are at reduced cost, a consumer can experiment with the different blades and flexes looking for any advantage to improve their shot and in turn their overall game. 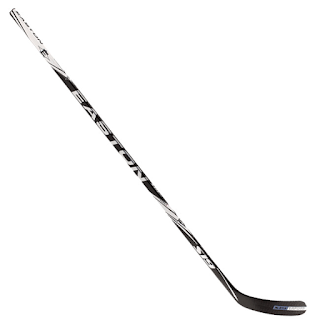 Most players try one or two curves when purchasing a stick and settle on that curve moving forward. Clearance hockey sticks allow for a consumer to see what else is out there and see if a different curve and flex suits their game better. The third benefit a consumer sees with clearance hockey sticks is the warranty replacement. Companies give a thirty day warranty to their sticks. If the consumer damages or breaks the stick within the allotted thirty days, the company will replace the stick one time with the consumer paying just the shipping and handling for sending the broken one back. Because the stick is no longer made by the company, the consumer is sent the current model stick of equal value as a replacement for the clearance stick. In closing, we at HockeyBoss believe consumers should start reaping the benefits of purchasing clearance hockey sticks. It gives the player the ability to experiment with the different patterns and flexes as well the different stick companies. Finally, it allows the player to spend the savings from the sticks on more crucial pieces of equipment. We see alot of happy kids being active, being involved in a team and we see a large number of kids participating in what we think is the greatest sport to play. The changes that have occurred over time have created more exposure to the sport then ever before. They have allowed for more players to be part of what was once called elite. The question we need to take away here is, can travel hockey still be considered elite? Historically, the northeast created an exclusivity to travel hockey tryouts as well as overall organizations. There were regulations on how many travel club teams could be started. They based their limitations on overall region as well as mile radius and distance from one another. The regulations that the league mandated in the past, created a set number of elite travel organizations. Only the best can play. Now, with their more lenient, democratic approach, we are left with a saturated industry. Expansion of the teams have left the talent on most teams sub par. They are accepted from the beginning, immediate gratification, without truly ever needing to work hard for it. Purposely scheduling travel hockey tryouts at the same time, same day, creates pressure to decide on where you fit as a player, as well as to deter any team hopping. These days, teams are chosen and contracts are being signed on the first day of tryouts. Immediate placement on the team. We have to wonder why that is done, is in the best interest of the players or the coaches, or the integrity of the teams or is it in the best interest of the organization as a business? In the days past, players seemed to be really trying out, they were nervous, they had to fight for it and the teams were filled by the third day of travel hockey tryouts. You either made it or you didnt. It sounds harsh, at least in today's gauge of parenting and raising children. But in the past, there were recreational or town leagues, there was a place for those players to go, a place to play and improve. 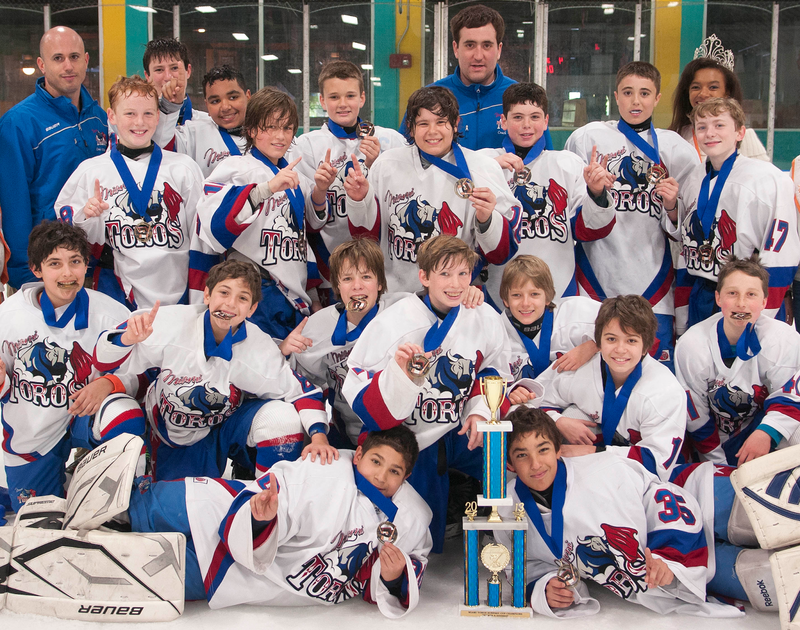 Travel hockey tryouts would come around again the following year, and that player will fight for a spot on that team. The fight is not something you can teach a child who has never felt the rejection. Are today's players getting a false sense of reality? Im afraid that sometimes they are. In closing, the organizations may be saturated and the skill level may not be where it once was, but being involved in the industry and watching as the changes occurred, I can also see and appreciate how much ice hockey has grown through these years. If we feel that the players are not at the caliber they once were, if we feel that the level of play is not good enough for travel hockey, then I believe that it is up to those involved in the ice hockey business to help make them better. 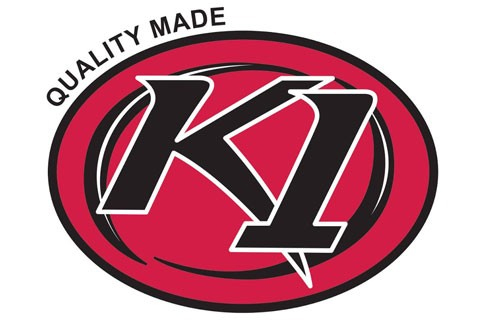 Offering more clinics, camps, private lessons focusing on the the core aspects of skating, stick and puck handling and overall knowledge and understanding of the game is where we need to take these to players to the next level. 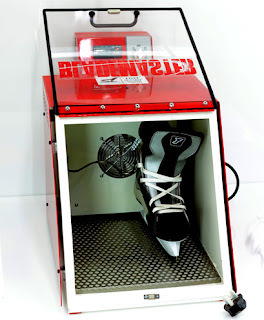 How to size hockey skates is a learned skill that takes experience, knowledge in the brand and a whole lot of investigation! Unlike shopping for a street shoe, the look, style and brand really should have no weight in a skate purchasing decision, the most important factor is fit and feel. 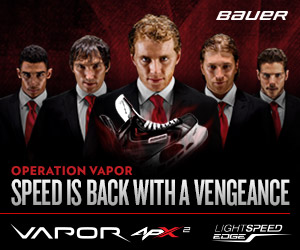 Anyone involved or even interested in hockey today, knows that Bauer is the most sought after brand. Being involved in the business aspect of hockey, and knowing how to size a hockey skate, and doing it on a daily basis, anyone here at HockeyBoss.com will tell you that most young players skate shopping want Bauer. It is no secret that it is the most popular brand right now. Endless marketing dollars allow Bauer to set themselves on top, claiming they are the best, most elite and versatile for all players. To some players they actually are the best fit for them, but if your pro shop professional knows how to size hockey skates correctly he will be able to fit you in the most comfortable and appropriate skate for your foot, regardless of the brand. 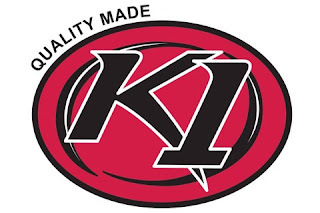 The most important aspect to consider when purchasing hockey skates is how well the skate is working for you, how comfortable the brands' skate is for your foot, and most important, finding a pro shop that you can put your trust in. In a service dependent sport as hockey, it is so important to shop at a store that is knowledgeable and can take care of your investment. Simply deciding that you want to wear the same skate as your favorite NHL player and buying them online without a proper fitting, without having your trusted pro shop professional see you walk and talk to you about your level of play could be detrimental to your game and even your feet. Several issues can arise if you have been fit in a skate by a shop that does not how to size a hockey skate. The biggest sign that you are in the wrong skate or wrong size skate is if your heel is constantly popping out while playing or while taking a stride. It is an indication that you are in the wrong size skate. If taken to a pro shop that knows how to size hockey skates, they will remove the foot bed from the skate and have you stand on it. At that point they will be able to diagnose if the skate is the wrong size. If you see creases in your skate, that is also an indication that the skate may be the incorrect size and is collapsing causing a crease on the side of your boot. These types of issues can be avoided by purchasing skates from an trusted pro shop professional that knows how to size a hockey skate. The first few questions an experienced pro shop retailer should be asking are, what type of skate are you in now. Bringing your skates to the store is also very helpful as the professional can see the wear and tear, see any creases and make adjustments from there. A sign that you know you are with someone experienced and that they know how to size a hockey skate is if they ask you how many times a week are you on the ice. This tell them a little about the type of player you are as well as the stiffness in a skate that will be required in order to hold up for the player. They will look at your feet, use a brand appropriate scale to measure your size, and take your weight into consideration as well... but the most important aspect is the conversation they will be engaging you in, trying to piece all the information you give them together to find the perfect skate for you. Check back soon for more blog article focused on brand specific skate fittings. Everything you need to know about purchasing a personalized hockey jersey. Devoted fans, girlfriend of devoted fans or grandma looking to give the perfect holiday gift for their favorite hockey fan should be asking about quality when buying personalized hockey jerseys. We cringe here at Hockey Boss when we see heat applied lettering on a pro player jersey. When paying top dollar for an NHL replica or even premiere style jersey, the quality of the lettering on the back of personalized hockey jerseys should be sewn, just as the pros wear. 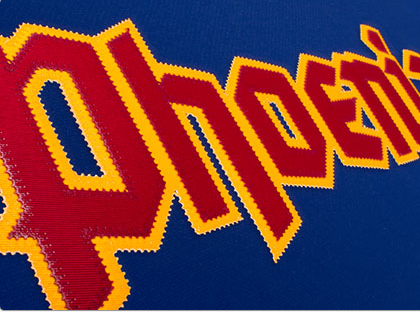 Not only does heat applied lettering peel off, there is a product that is often used to cut cost and production time that has etched stitches on the material to make it appear as if the lettering were hand sewn, but in reality, peels off, looks shiny, fake and just not up to any personalized hockey jersey standards. From a production standpoint, who would not want to save time, save money and keep everything simple? Its a no brainer to a facility who just wants to efficiently produce an order. Their mindset is to get the order out to the customer as quickly as possible and using a product like 'sim-stitch' allows them to do that. Personalized hockey jerseys used to be business they had to turn away and now they can easily accomplish the task and make the sale. What they dont know is that after a few wears and washes those letters start to peel off. The customer is disappointed in the quality, and they end up bringing their sad, knock off personalized hockey jerseys into a hockey production facility like Hockey Boss to correct the epic mistake and have those peeling letters sewn down. So how does all this translate for the consumer? Its quite simple actually... You pay the same for a product that looks as if it is the real deal, but really you are being tricked. Care for a metaphor? Its like going into Louis Vuitton and buying a handbag that looks like a real Louis Vuitton bag, but in reality is not at all. The same leather is used, but instead of it being sewed together, its glued. Its no secret that a trip to Chinatown can get you that same bag, but the difference is you pay ten dollar. With personalized hockey jerseys, the consumer is being duped but they pay the same and receive an inferior product. hockeyboss.com/personalized-hockey-jerseys But if you already have the jersey and just need the the lettering, or you are looking for an old, hard-to-come-by third personalized hockey jersey and we are out of that inventory and you were hoping to stay local. Start by having a conversation with the the vendors when selecting the apparel shop to do the job, be sure to bring up the following points, so you can feel confident you are getting what you paid for. Get that pro autograph on permanent sewn lettering. Start the exchange by explaining that you are looking for vendors to get a personalized hockey jersey done. Be sure to mention that it is an replica NHL jersey you would like to have your favorite players name and player number sewn onto. If they seem to be receptive and confident ask the following questions. - Do you cut the lettering in your facility? This is an important question because if they answer is no, you are going to want to make sure that they are not using a heat applied method, specifically the 'sim-stitch' no sew product. If they do in fact cut on site, tell them that you will supply them with either a link or a printout to the the lettering and color of the lettering the team using with their official jerseys so your can match exact. Also ask if a color is needed that they do not stock, will they charge a fee to order? 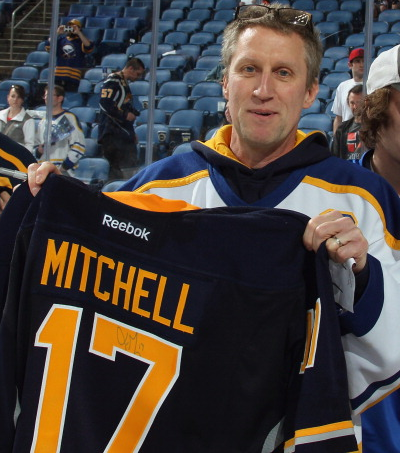 How disappointed would you be if you received your personalized hockey jersey but in the wrong shade of blue or gold? Be sure to be pro active when ordering and not to assume that the vendor is a hockey fan and knows the teams colors. - Is the lettering sewn onto the jersey? Be sure to share your knowledge you learned here and express that you do not want a heat applied, no sew product used on your personalized hockey jerseys. Its your investment, and you will be wearing of gifting this so be sure to get what you want. - Ask your vendor how they plan to execute your job. At Hockey Boss, we have two options on how to personalize hockey jerseys. After we cut the lettering, the jersey will either be sewn by hand on a sewing machine, or on our top of the line embroidery machines that can run mulitple jerseys at one time. Both methods are highly effective and suitable for the job. The standard pricing should be under $75-100. Keep in mind some pro teams have only one color sewn lettering (Toronto) and some have three colors (Pittsburgh). It would not be unfair if you vendor wanted to charge on the higher side for three color sewn lettering as it is triple the material and work.